We think we know the man inside the hoodie, the maestro of the monosyllable, the scowl on the sideline, the cold-blooded, humorless molder of champions. INDIANAPOLIS — A boy needed a mentor. A cancer patient needed a hand. A baseball manager needed direction, and a football great needed an angel. They all needed a friend, and Bill Belichick was there. 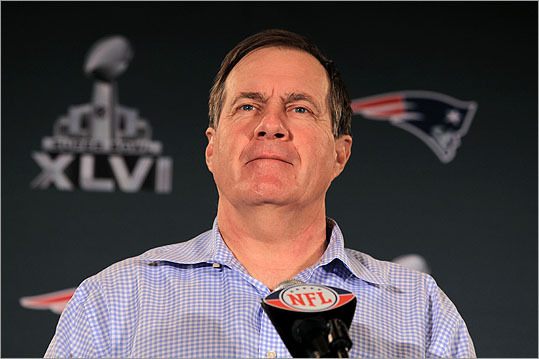 Not the Belichick of Patriots lore, the glowering titan of NFL coaches. The private Belichick. The guy who loves the Grateful Dead, reads Harry Potter, and happily reminisces with his pals about some of the best days of his life: growing up at the US Naval Academy, presiding over his college’s Animal House fraternity, belting out the 1960s pop hit “Love Potion No. 9” for family and friends on a sunny afternoon on his beloved Nantucket. Perhaps more than any other great coach in NFL history, Belichick is a man of two lives. An estimated 1 billion television viewers tonight will see the Belichick most New Englanders know: a gridiron mastermind, largely devoid of public charm and charisma, pursuing the fourth Super Bowl title of his 12- year Patriots reign. They will see a tight-faced tactician chasing football history, and maybe, if the Patriots prevail, flashing a cathartic smile. They will never see the other Belichick, who fights as fiercely to shield himself from the flimsiness of celebrity — “the scentless sunflower,” as Oliver Wendell Holmes described it — as he does to sustain an array of friendships that will last a lifetime. Belichick spoke to many of his friends in recent days as he prepared to embrace one of his greatest challenges since he began analyzing football film at age 9. NFL Hall of Famer JimBrown has dedicated most of his life to helping the dispossessed, including inmates, gang members, and needy children. He said two men have distinguished themselves with their shared commitment to humanitarianism: Belichick and Boston Celtics great Bill Russell. Belichick has visited prisons and gangs with Brown and has financially backed his Amer-I-Can program. In 2006, Belichick surprised Brown at his 70th birthday party in Los Angeles. And when Brown least expected it, he received a gift from Belichick last Christmas. More than 15 of Belichick’s friends said in interviews that the public Belichick — typically gruff with the media, tough on his players — is a stranger to them. Their Belichick leaves no friend behind. Belichick once had one of those relationships. As a child in Annapolis, Md., he often shadowed his father, Steve, an assistant football coach at Navy who gained acclaim as the nation’s preeminent college scout (he authored the 1963 primer “Football Scouting Methods”). Navy’s star at the time was Joe Bellino, a Heisman Trophy winner who later played for the Patriots. Bellino befriended the young Belichick and made sure at his graduation in 1960 that his midshipman’s cap landed in the 8- year-old’s hands. Belichick, who turns 60 in April, has held tight to the friendship. After Belichick’s father died in 2005, he reciprocated Bellino’s long-ago act of kindness by returning the cap. “He said, “Maybe your grandkids would like it,’ ” Bellino recalled. To Bellino, Belichick’s gesture epitomized his respect for history. Belichick has often asked Bellino to address Patriots rookies about football tradition. “He thinks it’s his responsibility to pass along as much as he can to the next generation,” Bellino said. Nearly 40 years have passed since Bob Heller beat out Belichick for the starting center’s job on Wesleyan’s football team. But when Belichick learned several years ago that Heller had been diagnosed with cancer, he quietly spearheaded a campaign to ensure that Heller was inducted into the school’s athletic hall of fame. Belichick last week contacted Heller, a Seattle lawyer whose medical condition prevented him from traveling with his Wesleyan teammates to the Super Bowl. Belichick assured Heller his teammates would remember him when they gather on the field for apregame picture. Belichick sets high expectations for his friends. Little angers him more than disloyalty, as his former protege and assistant Eric Mangini learned in 2006 after he defected to the despised New York Jets and supported allegations that Belichick cheated in the infamous Spygate scandal. Belichick’s subsequent iciness toward Mangini was captured in headlines and photographs, a friendship irreparably fractured. Gone was the warmth of their Wesleyan connection (Belichick was class of ’75, Mangini ’94). Belichick’s college years were formative, a time when he felt free to show a wilder, gregarious side he now zealously keeps out of view. As president of Chi Psi fraternity, he led a house bursting with hard-partying renegades, whose alleged misdeeds included urinating on a rival frat and breaking several windows. Another night Belichick was jolted awake by a frat brother firing a shotgun at a soda machine that ate his quarter. Belichick himself was no angel. On a Friday trip to a hockey game at Phillips Andover, which he briefly attended as a postgraduate student, Belichick and his college roommate Bill Deveraux bumped into a couple of friends from Harvard. Their brief visit to Andover turned into a sudsy bacchanal in Cambridge. “We ended up at Harvard, drinking beer and raising hell for two more days,” recalled Deveraux, a Rhode Island lawyer. There was a memorable outing to Winter Carnival in Quebec City and annual road trips to Mardi Gras in New Orleans. On the Mardi Gras journeys, Belichick stopped along the way at Birmingham- Southern College in Alabama to see his future wife, Debby, his friend from Annapolis High School. One year Debby joined the caravan to Mardi Gras. On another trip to New Orleans, Belichick’s posse ran out of money, prompting him to call his father for help. Belichick’s father contacted JimRoyer, an assistant coach for the Saints, who took in the Wesleyan crew. While Belichick’s buddies partied on, he stayed behind to talk football with Royer. “No surprise there,” Celeste said. He recalled Belichick regularly angering his football teammates by quizzing the coach about whether he had developed contingencies for virtually every unusual play an opponent might attempt. Belichick’s questions invariably prolonged practices. Belichick distinguished himself at Wesleyan not only with his football acumen but his leadership. Friends said Belichick alone had the ability to prevent administrators from closing Chi Psi for the frat’s numerous infractions. “Bill was the responsible conscience of the place,” Deveraux said. Farrell, who owns Farrell Volvo in Southborough, met his future wife, Nina, at Wesleyan, after Belichick forged a friendship with her (Bill and Nina took 7 a.m. ice skating lessons together as freshmen). Nina baked Belichick 101 brickle cookies after he won his 100th game with the Patriots, and Jimdelivered a big tin of the cookies to the coach after the Patriots defeated the Broncos last month in their divisional playoff. Belichick has shown loyalty to the Farrells in part by shunning offers of free cars from other dealers seeking endorsements and buying all his family vehicles from Farrell Volvo. He was driving a Volvo wagon in the recent NFL Network documentary, “Bill Belichick: A Football Life,” when he blithely belied his public image as a genius by confessing his inability to set the dashboard clock. Not all of Belichick’s friends were willing to be interviewed and some spoke only on the condition they not be identified. They are keenly aware of Belichick’s hunger for privacy, which his assistant, Berj Najarian, helps enforce. One of Belichick’s Wesleyan friends said Najarian warned him to “behave” with the media. The secrecy, however, has been difficult for some of Belichick’s friends to stomach. Belichick was reluctant last week to discuss his desire for privacy. Public attention “comes with the territory but it’s nice to have some private time,” he said. “Sometimes it comes in small doses.” Belichick’s most painful brush with celebrity came soon after he and Debby divorced in 2006. He became tabloid fodder when the husband of a former New York Giants receptionist alleged in a divorce case that his wife had been involved for several years with Belichick and had received hundreds of thousands of dollars of support from him. Belichick never publicly addressed the matter, which was resolved without him appearing in court. In 2006, he also formed a Massachusetts corporation, Bill Belichick Inc., whose stated purpose was “conducting a general business of consulting, entertaining, and endorsing, consisting of public appearances, public speaking, television appearances, etc. . . .” He dissolved the business 16 months later. sA friend involved in the matter who asked not to be identified said Belichick formed the company because he no longer would participate in the Bill and Debby Belichick Charity Foundation after his divorce. The friend said Belichick dissolved the business because he concluded he had little interest in pursuing endorsement opportunities. His paid appearances are mostly limited to radio and television interviews during the season. The Patriots pay him about $7.5 million a year. Many people noticed that Belichick was more at ease, more jovial than usual this Super Bowl week. The trademark scowl was shelved, and some wondered why. The couple began dating five years ago, and while Holliday has gained an extra measure of celebrity by co-hosting the “styleboston” magazine show on Channel 5. Belichick has maintained a relatively low profile beyond his professional duties. Other than his long friendship with rock singer Jon Bon Jovi, Belichick has shown no interest in collecting famous acquaintances. He loathes bling and, though he is driven to cement his place among the NFL’s all-time coaching elite, he generally shuns self-promotion. One of his few visible concessions to pride was naming his Nantucket boat “V Rings,” which he hopes to make VI — IV with the Patriots and II as a Giants assistant. Other than boating and fishing, one of Belichick’s leisure passions is lacrosse — his best sport in college — which he taught his children. Amanda, 27, and Stephen, 24, played lacrosse at UMass and Rutgers respectively, and his youngest son, Brian, 20, is expected to play this year at Trinity College in Hartford. Dave Pietramala, the lacrosse coach at Johns Hopkins University, said it’s a shame the public knows so little about the everyday Belichick. In the hours before the Patriots defeated the Ravens two weeks ago at Gillette Stadium for the conference championship, Pietramala, at Belichick’s invitation, sat in the coach’s office with him as he prepared for the game. Belichick turned to Pietramala for advice in 2007 after Patriots defensive end Marquise Hill died in a jet ski accident. Two years earlier, one of Pietramala’s players, Matt Stoffel, had died in a car crash. At other times, Belichick has stunned lacrosse friends with his compassion. When Navy lacrosse coach Richie Meade last year was relieved of his job, he was surprised to hear from Belichick. Meade had been a friend of Belichick’s father. “Out of the blue, Bill calls me and says, “Hey Richie, the Rutgers job is open. If you’re interested, don’t hesitate to use me,’ ” Meade recalled. Springing welcome surprises is routine with Belichick, as Farrell was reminded when the coach appeared recently at his father’s funeral. Their Wesleyan pal Vinnie Colelli was unaware Belichick had donated to his family’s church in Milford last year in his late father’s honor until the Globe informed him. And when Casey Coleman, the Cleveland Browns radio broadcaster, died on Thanksgiving weekend in 2006, Belichick broke away from the Patriots to attend the wake in Cleveland. Belichick, who coached the Browns from 1991-95, was so reviled in Cleveland after he cut quarterback Bernie Kosar that he received death threats. So did Coleman, one of Belichick’s lone defenders. Both families received FBI protection. The folks at the Lazarus House emergency shelter in Lawrence agreed. After informing shelter managers he wanted no publicity, Belichick occasionally brought his children there when they were younger to help cook meals and serve clients in crisis. Belichick’s benevolence also extends to the Massachusettsbased AccesSportAmerica. Thanks to Belichick earmarking his royalties from David Halberstam’s book, “The Education of a Coach,” to the nonprofit, more than $100,000 has gone to helping children and adults with disabilities participate in recreational activities, according to the founder, the Rev. Ross Lilley. Still, despite all that, Belichick strikes some folks outside his circle of friends as aloof and imposing. Charlie Moore, television’s Mad Fisherman, said he fears few men but has flinched every time he has tried to ask Belichick to go fishing with him. Moore said he would like “to bring out the little kid in Bill.” Belichick’s friends know that kid as well as they know the man. And, win or lose tonight, they know their brotherhood will endure.